How our neighbors up North became a powerhouse of comedy. Rick Moranis and Dave Thomas in a sketch for SCTV. Courtesy of The Canadian Press via The Star. Consider Canada’s exports for a moment, and your mind might wander to visions of lumber, maple syrup, and trapper hats. But one of the country’s greatest legacies has been quietly stoking the Hollywood machine for decades: comedy. Look at how many of our leading comic actors come from up North: Samantha Bee, Jim Carrey, Catherine O’Hara, Seth Rogen, Will Arnett, Caroline Rhea, Ryan Reynolds, Dan Aykroyd, Martin Short, Mike Myers, Norm MacDonald, John Candy, and Rick Moranis all hail from Canada–just to name a few. And it is not only performers: Canadian audiences are huge comedy fans. Culture Track: Canada, LaPlaca Cohen’s newest Culture Track study developed in partnership with Business / Arts, found that 55% of cultural consumers surveyed go to a comedy or variety show at least once a year. 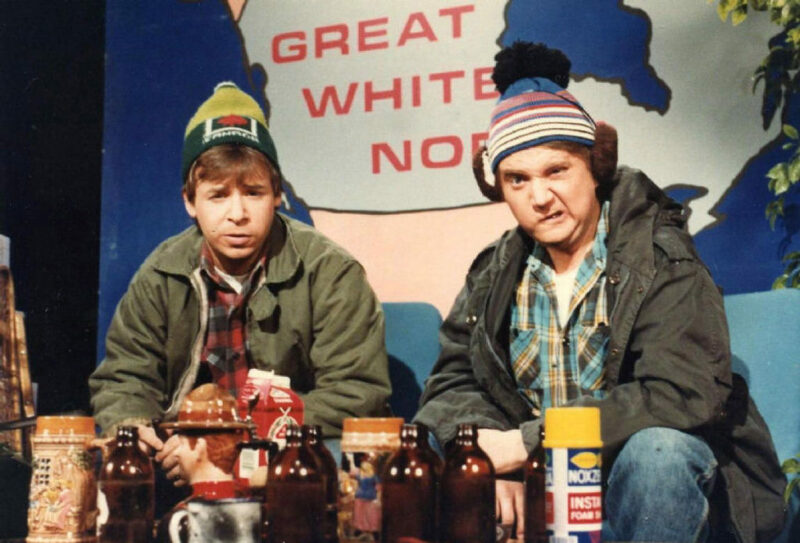 So what is the secret to “Canadiana,” Canada’s patriotic, unabashedly weird humor? And why do so many Canadians attend comedy shows? The answer is a mixture of historical precedent, an impressive set of resources for comedians to showcase their talents, and a culture defined by its outsider status and eclectic heritage. Many believe that the first Canadian humorist was the Presbyterian minister, teacher, and author Thomas McCulloch, who wrote the satirical “Letters of Mephibosheth Stepsure.” The letters, sardonic essays on life in 19th century Nova Scotia, were first published in serial form in the Acadian Recorder from 1821-1823, and were later reprinted in a single volume, The Stepsure Letters, in 1862. Northrop Frye, a prominent Canadian cultural and literary critic, has called McCulloch “the founder of genuine Canadian humor.” The letters, with their sharp insights delivered in an unassuming tone, encapsulated a uniquely Canadian point of view, combining politeness with satire, setting up a precedent of comedy as a vehicle for cultural criticism. In “The Cultural Critique of Gender Parody in Canadian Sketch Comedy,” Danielle Jeanine Deveau writes, “In Canada, comedy has long served as a vital form of cultural critique, by providing space for a mainstream dialogue on controversial and often overlooked issues.” Much like The Stepsure Letters, comedy in Canada gives performers and audiences the opportunity to express their grievances under the guise of entertainment. In the early 20th century, American radio programs were Canadian audiences’ entertainment of choice. In response to the medium’s growing popularity, and in an attempt to carve out a place for Canada in the expanding world of comedy programming, the Canadian Broadcasting Corporation (CBC) was established in 1928. Several classic Canadian comedy programs got their start as radio shows, and later transitioned to television– for example, the Wayne and Shuster, which had its radio debut in 1946 and moved to TV in 1954; The Royal Canadian Air Farce, which debuted on 1973 and transitioned to TV in 1994; and the radio program Frantic Times which aired on the radio in 1981 and went on to become the television show Four On The Floor in 1986. Original cast members of SCTV. Courtesy of The Star. After the success of radio-turned-television programming, comedy shows made exclusively for television followed. The most popular format for these programs was the sketch show. 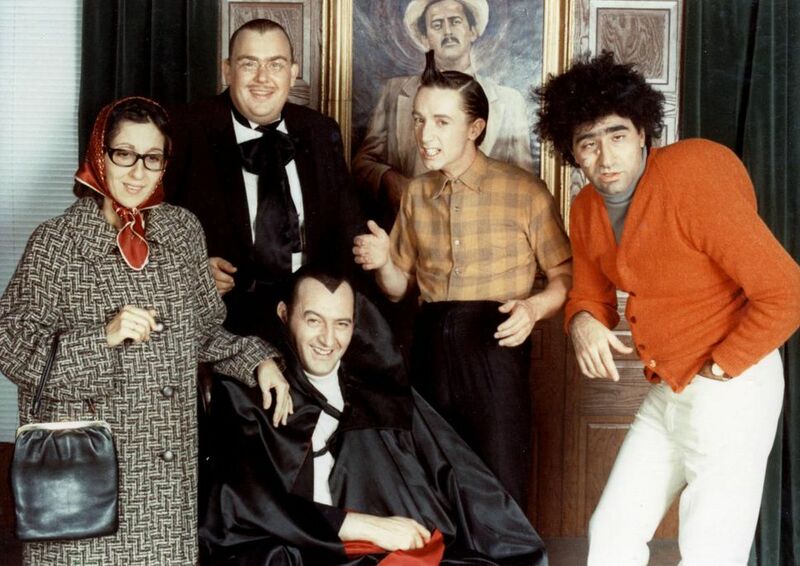 Perhaps the most famous example of a Canadian sketch show is SCTV, which premiered on television a year after Saturday Night Live. SCTV, which aired until 1984, marked the debut of several successful comic actors, including Andrea Martin, Eugene Levy, Rick Moranis, and Catherine O’Hara, and unleashed characters like Ed Grimley and Perini Scleroso on the world. 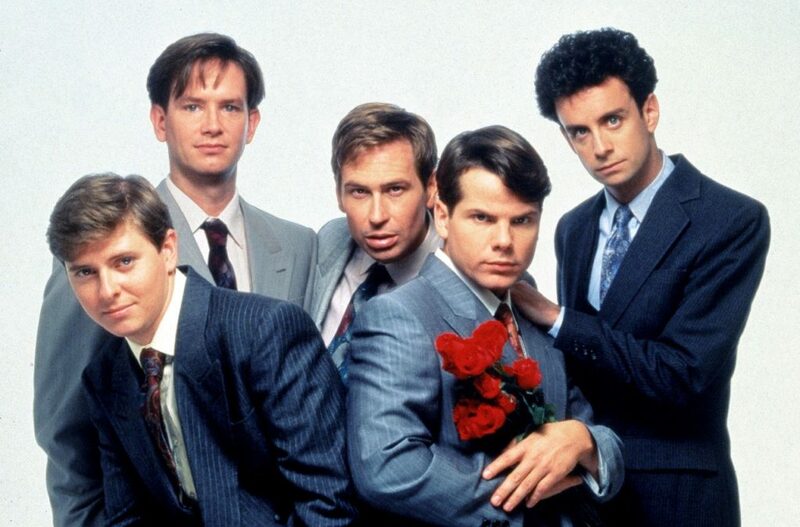 Following the success of SCTV, The Kids in The Hall premiered in 1988, going on to be one of Canada’s favorite TV shows until its finale in 1994. In 1991, The Red-Green Show debuted and ran until 2006. In “The Cultural Critique of Gender Parody in Canadian Sketch Comedy,” Danielle Jeanine Deveau theorizes that sketch comedy is so popular in Canada because in sketch comedy, “unlike situation comedy, domestic disorder and social disruption are not righted at the end of the sketch. The sketch world is one of permanent social disruption and is characterized not only by marginality, but also by constant estrangement from normative comforts.” Canadian sketch comedy is marked by outlandish and maladjusted characters, reacting to the mundanity of the ordinary world in increasingly outrageous ways. In sketch comedy, actors can comment on the world’s dysfunction without the need to right its wrongs. Cast of The Kids in The Hall. Courtesy of PopDose.com. Another favorite genre of Canadian TV is political satire. Deveau hypothesizes that political comedy is so popular in Canada because “In Canada, comedy has long served as a vital form of cultural critique, by providing space for a mainstream dialogue on controversial and often overlooked issues.” Made In Canada took on domestic news from 1998 to 2003. The political sketch show This Hour Has 22 Minutes has been airing since 1993, and its spin-off, The Rick Mercer Report, has been on the air since 2004, proving that Canadian audiences have an appetite for a satirical take on current events. The new millennium signified the beginning of a golden age of Canadian sitcoms. Trailer Park Boys (2000-07), Corner Gas (2004-09), and Little Mosque on the Prairie (2007-present) established that Canadian comedy could encompass more than political satire and sketch comedy–it could also produce sitcoms to rival those made in the US. These new sitcoms presented a view of Canada that was more diverse and true-to-life than previous sketch shows; rather than reveling in absurdity, these sitcoms dug into social, economic, and political issues faced by Canadians. Canada also has a huge live comedy scene. The country hosts some of the world’s most elite comedy festivals, where comedians from all over showcase their best material in the hopes of getting more fans, more money, and, best of all, a special. Festivals include the HubCap Comedy festival, and Toronto Sketch Fest. The Just for Laughs festival, which has locations in Toronto and Montreal, has been called “the Coachella of comedy.” It is the world’s largest comedy festival, attracting some 2 million visitors in addition to the industry’s biggest stars for a week of shows, panels, and events for the past 36 years. But Just for Laughs has also been the source of controversy lately. Its co-founder, Gilbert Rozon, resigned last year after nine women came forward with stories of being assaulted by Rozon. Meanwhile, SheDot, Canada’s only female-focused comedy showcase, had its final run this May. So what differentiates Canadian humor from American humor– or that of any nationality? Several theories abound. Some argue that Canadian humor is the result of an eclectic culture that is equally influenced by France, the United Kingdom, and the United States. Dan Aykyroyd, star of Ghostbusters and Saturday Night Live, tells McCall, “I think the average kid grew up with a mix of the British and the U.S. to make an all-rounded view of comedy and one which stressed satire–political and social–and an observant kind of view of the rest of the world.” As LaPorte writes, “From its French and British heritage to its close proximity to the U.S., Canada’s cultural identity is ultimately a composite creation; a swirl of surprising, even contradictory, influences. British manners (that niceness), French old-worldness, American music and TV.” And Canadian comedy programming is starting to reflect an increasingly diverse nation. 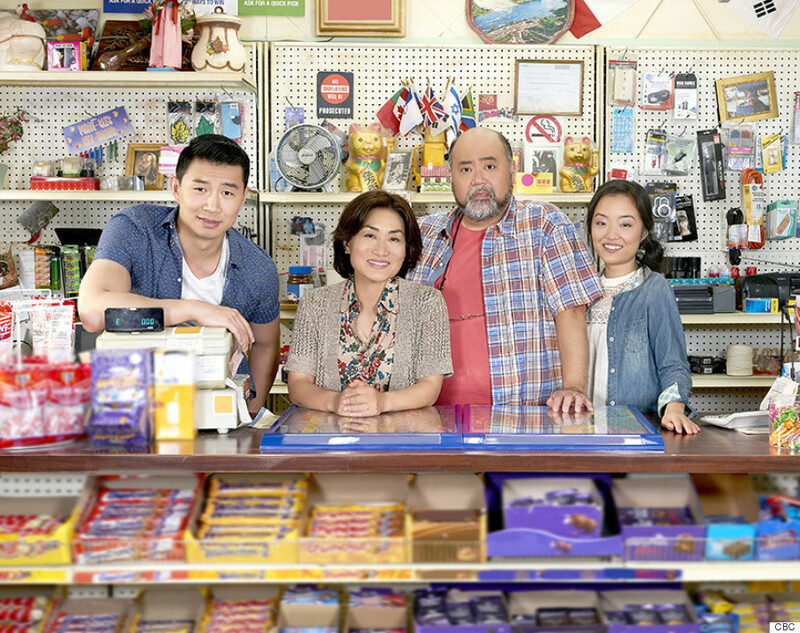 Taub and Fisher write, “As Canada becomes an increasingly urban and immigrant nation, that identity is being explored through a new strain of Canadiana outsider comedy.” Take, for example, the sitcom “Kim’s Convenience,” based on the play by the South Korean-born Ins Choi, which follows immigrant families in Toronto’s suburbs. The cast of Kim’s Convenience. Courtesy of HuffingtonPost Canada. 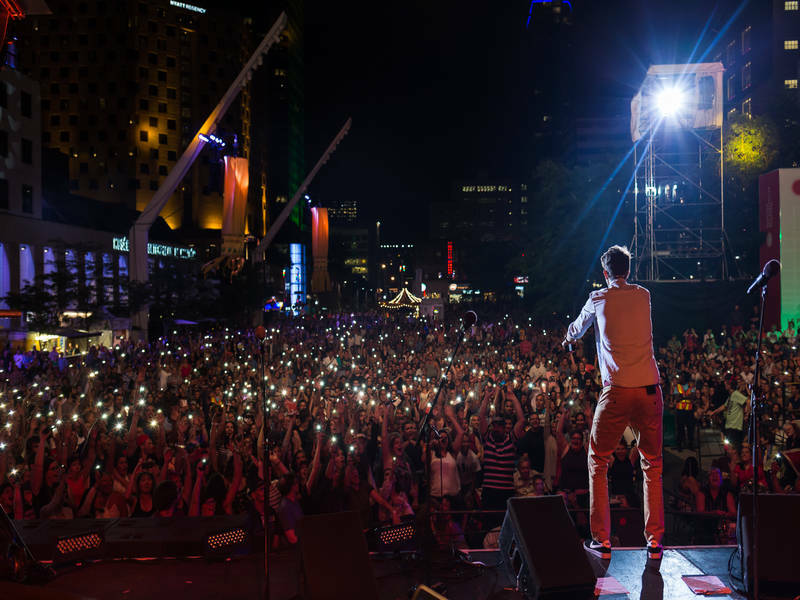 Montreal’s Just for Laughs festival. Courtesy of Jeremy Demay and V. Gaumaud via Quebec Original. It should be noted that, despite Canadian comedy’s reputation for prioritizing “outsider” or “minority” perspectives, there is a substantial lack of diversity in the Canadian comedy scene. Geeta Sondhi’s 2017 documentary Stand Up Toronto highlights the overwhelming whiteness of Canadian comedy lineups. In the film, Danish Anwar, a comedian who has put in six years of stand-up for Canadian audiences, says, “There’s less than half a dozen major decision makers in [Canadian comedy] … to them, ‘normal’ means straight white guy. They’re underestimating their own audience. They think everybody thinks like them.” Mark James Heath, who is from Chicago and spent years honing his routine there before emigrating to Toronto, says, “Canada, unfortunately, in terms of mainstream comedy stages and in terms of television, is pretty old-fashioned and regressive,” adding, “The Canadian entertainment industry doesn’t really reflect the diversity that is actually here, let alone here in Toronto.” There are correctives, of course. For example, Kenny Robinson’s The Nubian Show, which celebrated its 20th anniversary in April, is a famed testing ground for comedians of color. Zabrina Chevannes, frustrated with the homogeneity of Toronto comedy clubs, started the showcase Things Black Girls Say, to great success. Chevannes says, “The response from audience members – young, old, black, white – has been great. From the first time that I did the show, it’s been sold out.” The producer Derryck Birch is also consciously creating bills for non-white performers under the moniker Deez Laughs. Birch explains, “I noticed there were many funny non-white comedians who weren’t getting the kind of stage time others were getting, and I definitely wanted to help them.” Despite the success of alternative shows and a rising crop of increasingly diverse comedians, there is still far to go to make Canadian comedy reflect Canadian populations. Frankie Agyemang (aka Trixx), a Nubian Show regular, explains, “When you look at the comedy festivals in this country, when you look at the comedy clubs, when you look at the Comedy Network, black comics don’t get the opportunities that white comics get. As a black comedian, you have to get to a level where you’re undeniable before they’ll feature you here.” Chris Robinson agrees, adding that promoters are, “happy to have 100 middle-aged white guys [onstage], but two Young, Cool Black Guys is too many.” The problem is not a lack of talent available in Canada–it is an institutional resistance on the part of bookers and promoters to featuring comedians of color as heavily as white performers.